The other day I was taking a well earned break from surfing the web on my computer, by surfing the web on my phone and came across an interesting article on being 'Internet Lite'. At the time I didn't think much of it, but recently I have begun to notice how much time I spend glued to the internet on one of my many devices. It got me thinking about the article (I cannot remember where it was but I will try to find it). The idea of Internet Lite is to minimise the time you spend randomly browsing the internet and maximise your awareness of what's going on around you.In many real life social interactions any silence or break in communication is filled in with a mobile phone or tablet, we no longer have use our minds to think of the next conversation starter. There is always something to discuss on the internet, however trivial it might be. I think this, in some ways, could hide issues that really need discussing. The issue becomes worse when you are on your own. Whilst taking a bus journey a couple of weeks ago I arrived at my destination not really aware of how I got there. I had walked out of my house, got my phone out of my pocket and that was it. I was slightly horrified to think that the whole mundane, but valuable, 30 min was spent reading nonsense on one of many social networks. I could have read a book, drawn a picture (badly, thats why I am a photographer), even stared out of the window. All things that could have inspired me or improved me in some way. That is not to say that the internet is an evil black hole of procrastination, but it is not the only way to gain inspiration and stay in touch with people. When you think about it honestly, you probably spend most of your spare time on the internet. I know I do. The idea of going Internet Lite (for me at least) is to reduce the time spent on the internet and pay more attention to other forms of interaction and inspiration. That's not to say I'll cut the internet out of my life altogether, but I will try to increase my productivity when I am on it. Over the festive period I will only use the internet for 1 hour a day. A designated hour at that. The only time in the day that I can browse the web, use social networks and check my email will be between 15:00 and 16:00. It doesn't sound too hard but when you actually start adding up how often you mindlessly do it during a day, it starts to sound more of a challenge! I hope this will mean that I can concentrate on spending time with my family and other activities I might have bypassed, whilst looking at more photos of cats. I am beginning to make some lifestyle changes that will boost my creativity and productivity, which will help make 2014 the best year yet. Ps. Found the original article in being Internet-Lite over on be more with less. Over the years I have spoken to many people about the art of portrait taking and specifically the use of flash. A few people have shown me images with the accompanying statement of "if I had better lights" or "if I had this bit of equipment", "then the shot would have been better". Well in a lot of cases this is not true.Some people miss the point of portrait taking, they are too interested in lighting, where to put the key light, how many lights should I use etc. Any connection with the subject is lost in amongst the technical babble. A photograph of an uncomfortable, bored subject is just that, no matter how many lights people throw at them. This is where the problem lies, Many people have never taken a thoughtful portrait using just available light, before jumping in with the flash guns. Whilst doing my travel and documentary work I have honed my skills at taking portraits with just the light available at the time, as it is sometimes too intrusive to bang away with the flash. This has helped me to understand the value of a portrait, and how different lighting works and how to adapt to different lighting conditions. I know how my light should look and this is then transferrable into the studio or with using flash. I can now say to myself, "if the sun was in this position my portrait would look better, but I want to keep the background as it is, so I will introduce my flash here." As most of you will know I have my own studio (for now), but this has not stopped me from utilising the lovely natural light that is available in the studio and in the corridors. In a recent shoot with Jade I ventured out into the corridors of the studio building. I found a nice bank of frosted glass windows that were filling the place with a lovely light. I used this as key light for most of the shots, but I also took a couple that were filled in using the white wall. I was shooting with a 70-200mm so i was shooting wide open at f2.8 and occasionally f 5.6, at iso 400. For natural light portraits I love shooting wide open as much as possible. These were taken on my latest shoot with Sithembile, I have already shown the shots taken with the studio lights in my previous post , but these were taken with just the light from the sky lights. again all taken at f2.8 on my 85mm, at iso 800. It was an overcast day the windows are frosted so it was really soft light. If you are inexperienced with taking portraits, try mastering them using available light and perhaps a reflector. Using flash adds a complication to the equation which just adds to the negative of the experience. Just strip it back to you, your subject and the available light and you will begin to see an improvement in your portraits. Work with the light, move your subject to get the most out of it, the results can be just as spectacular as using flash. Check out the work of Steve McCurry, when it comes to using natural light for portraits there are not many better. Thanks for reading, any question please email me at blog@darrenobrien.co.uk or leave a comment below. Welcome to the second part of my editing workflow series. In the last post, which looked at setting up Lightroom 3, I gave some tip on performance boosts to make Lightroom run just that little bit smoother. In this post I will take a look at Photoshop and how to optimise it to make it run that bit quicker and efficiently.Again to start with, it makes sense to have the fastest computer you can afford, RAM is one of the most important aspects of running design software like photoshop, so fit as much in as possible. I currently run 8GB Ram, which works fine for most things, but some complex tasks still take a bit longer to process. Now before I start with the program side of things, there is one thing that vastly improves performance and is relatively inexpensive is a Solid State Drive (SSD) these are like giant SD cards, and have no moving parts. The information is dragged from the drive without the delay you get with standard hardrives. Good practice would be to install photoshop onto the SSD and also use it for the Scratch disk (will talk about that later), this will drastically improve the speed which photoshop works on files etc. They are now relatively cheap like this 120gb Corsair on amazon. They are not the most reliable of items, so I wouldn't use them for storage of precious documents, but in terms of a performance boost they fantastic. Now for the software tips. Handily photoshop has all of the most important tuning parts in one window. This can be found by going to Edit => Preferences => Performance. I believe this is the same as CS4. You should now have something similar to the image below. As with Lightroom, Photoshops default memory usage is quite conservative. As a rule of thumb if you are running windows or Mac 32bit operating systems you can have it set to about 70% memory usage, this will mean that photoshop should run smoothly and not seize up other operations. If you are running a 64bit Windows or Mac, you can ramp the usage right up to 100% as photoshop will automatically take into account system RAM usage. As I tend to run Lightroom and Photoshop at the same time I have mine set between 75% and 80% whilst running 64bit windows. The Scratch disk is where photoshop saves temporary information which is too big for the RAM, but is still required for editing. Using a SSD for this would be ideal. The ideal scratch disk would be a fast HDD that is not the boot drive for the OS. It is very important to keep this drive de-fragmented and clear of clutter. I will be investing in a SSD soon for this purpose. The scratch disk needs plenty of space on it. This is very complicated to explain and there are a lot of permutations. Essentially this is where you tell photoshop what sort of files you will be working on, giving pr warning as to what to expect. This makes it a little quicker in determining how to handle your file. I won't go into too much detail here as there is already a good article on the Adobe website. With today's cameras running around 10mp or higher the best settings are "default" with a cache level of about 4, depending on the amount of RAM, again the more RAM the higher you can push that number, but 4 is adequate. If you are running a processor later than a Pentium 4 you can set the cache tile size to either 128K or 1024K if you are running a Pentium 4 or AMD processor set them at 132 K or 1032 K.
Editing Workflow Part 1: Overview and Optimising Lightroom. I have read and received many questions recently about editing workflow and decided to write about my experience achieveing a good workflow structure. My way of doing things will definately not be same as someone elses and it may not suit everyone. An editing workflow should be something you can do in your sleep and therefore needs to be familier and structured, however it should also quite organic and you should be ready to rethink and evaluate as you learn new tricks or find new software.This year I have introduced four new pieces of software into my workflow, 2 of which I use all the time and the others as an when they are needed. Traditionally my workflow basically involved Lightroom to import, catalogue and RAW editing, then Photoshop to do more detailed editing and finishing off, before going back to Lightroom to Export etc. This has worked well over the years, but I was finding it difficult to keep up with catalogue structures within Lightroom and sometimes trying to find images outside of lightroom became messy. I decided to change my importing and filing system so that I could find images without having to go to Lightroom. I moved from a descriptive filing system (eg, Commercial, Portraits, Landscapes etc) to a year and date one (i know obvious hey!). So I now have a 2012 folder with the months in subfolders and the shoots subfolders within them. I then Keyword images in Lightroom so they can still be indentified. I no longer use Lightroom to import images from my memory card. Since discovering Media Pro one from capture one i have decided to use that software to import etc. Mainly this is due to it being slightly quicker to import and backup images, but mainly I just preferred to handle this outside of Lightroom. Lightrooms inport module is still very good, but it is personal preference. I then just add the folder to the Lightroom catlogue afterwards. I will talk a little more about these in future blog posts. Before starting a workflow it is important to have things set up correctly and running smoothly. Obviously the main consideration is hardware if you have an old computer with no power then you will probably struggle to get Lightroom to run faster than walking pace, although Lightroom does have quite low minimum requirements so can be used on some really old machines. Assuming you are running a reasonable machine there are a couple of things you can do to make Lightroom handle quicker. 1. Increase the Cache size. Lightroom 3 uses the Adobe Camera Raw engine when you are working in the develop module. Adobe Camera Raw generates large previews everytime you make a change within the develop module and stores these in the cache folder. This is how you see the changes straight away. Now for some reason Lightroom 3 defaults on installation to a cache size of 1GB. When the cache file is full Lightroom will delete the oldest image file and this happens very quickly when working with modern RAW files. This causes the long delay in loading time when switching between images in the devlop module and sometimes when making adjustments especially when using the healing tools and adjusment brushes as they rely on this cached previews. The best thing to do is to increase the size of your cache folder depending on how much hardrive space you have available. Ideally the cache file will be stored on a fast drive that does not contain your OS. A small SSD would be excellent for such purposes. However it can be put anywhere ad it will be better than the default option. Mine is stored on my main hardrive (hopefully this will change soon) and I have it set to a size of 40GB (maximum is 50GB). To change the cachse setting you go to Edit > Preferences you then got to the "file handling" tab (see image below) choose the cache file location and size. 2. Create Previews on Import. I mentioned previews earlier and again this is a good practice to get into when importing into Lightroom. Lightroom relies a lot on previews when using the library module and depending what you tend to do in the library you can set to render previews on import so that you filck through your library quicker. If you just look at full screen images in the Library you can set to render "standard previews" these previews will take up less hard disk space, but will enable you to flick through images quicker. If, like me, you like to check focus using 1:1 views then rendering "1:1 previews" is a good option. It really speeds up the process in the library module. The main downside to this is that it takes a bit longer at the import stage, but I prefer that to sitting there waiting for previews to load. The rendering option is on the import screen (see image below). Thats it for this post. You should find that Lightroom will handle a little bit more efficiently. My next post will talk about speeding up and optimising Photoshop. Thanks for reading, please contact me with any questions about Lightroom or anything else for that matter. I run regular 1to1 and group tuition on Lightroom, photoshop and general photography. Contact me for more information. As you may have guessed, especially if you read my blog at all, that I am a massive fan of Black and White photography. I have written about using Silver FX pro from Nik software, which is my preferred method of converting black and whites. This is mainly for the convenience and the quality straight from the go.However one issue for me, because I use Lightroom 3 is that I have to export my image to some extent, either into photoshop or into Silver FX. I usually choose the photoshop route and use the filters, as it means I can edit other parts of the image at the same time. So over the Christmas period, when I was recovering from turkey and wine overload, I started looking into ways of achieving good results in Lightroom. I have previously looked into presets, both standard Lightroom ones and third party ones and to be honest I have not found any that I really like. I have to say that a couple of the creative B&W presets do a reasonable job sometimes, but often they are a bit severe. I therefore decided to dedicate some time and really look into the B&W functionality in Lightroom, away from presets and away from silver fx pro. The following is what I have found to be a good way of working, but obviously the method can be adapted. These are not all my ideas (obviously) but a mixture of methods found during my research. So my first thing I do is make a nice colour photo. I do all the usual white balance and exposure corrections and adjust the clarity and saturation (Clarity is quite important during B&W conversions as it boosts contrast between the colour tones). I also do a small adjustment on the curve, but this is slightly easier to do once the image is B&W. So now you will end up with a reasonable colour image. This is my example. I shot these image knowing that I was going to make it B&W. Now I change it to B&W by going to the colour adjustment panel and clicking the B&W tab. This is very similar to the channels tool in photoshop and what I have found very nice is the individual colour sliders, which you can use to adjust the look of the image and it is worth playing around with these to get the feel that you want. Now you could leave it there and you will have a nice B&W image, but with Lightroom it does tend to produce slightly cold B&W, by that I mean there seems to be a very faint blue cast, especially in the highlights. So I found this nice little remedy which gives you a really nice feel to the image and produces something similar to a Platinum print, but it is worth playing around as you may find something you prefer. For the sake of argument I shall call it the 50-50 effect and I have even saved it as a preset. Under the colour adjustment pallet you have the split toning pallet. Basically the hue is set to a value of 50 for both highlights and shadows. Now this will actually have no effect on your image until you up the saturation slider. The amount of saturation you use is entirely personal taste and I like to preserve the B&W look and not turn it sepia, but even setting the saturation to 1 on each will make a difference. Again its worth playing around to find the recipe you like. Here is the result from the earlier picture. Obviously you can then go back and make curves adjustments. I have included some more examples of this method below. The shot of St Mary's Lighthouse has also been through colour efex 4 tonal contrast filter, so is slightly cheating. I liked the result though. As part of a studio open day we welcomed Bryony into the studio to take part in a lighting demo. Once again the lighting was kept very simple to begin with using a softbox and umbrella combination similar to the one mentioned in my previous post with Laura. I won't dwell on it other than to reiterate how good this lighting set up is for some nice classical portraits. We then introduced a third light into the setup. We wanted more of a fashion look to this one so we went with soft box as a key light with an umbrella filling in the shadows caused by the hat. There was a second softbox at a 45 degree angle behind the model camera right. For a change I demoed the silver reflective umbrella, which is not something I use a lot, but it can be useful especially with a subject who has darker skin and any jewellery, as it really makes things glisten. In this case its the effect on Bryony's black hair that I really like. Then for a complete change we broke out the orange background and really went for a summery look, involving the wind machine. This bright and cheerful look was created by very simply having the octabox almost 45 degrees in front of the model camera right, and having a strobe with a barn door lighting the background, creating a very light halo effect around Bryony. This worked well to provide a nice even lighting whilst still having a bit of texture using a bit of contrast. One very important aspect to remember when photographing people is to explore every angle. The whole atmosphere can change just by moving around the model, in this case shooting from the shadow side has created a nice low key portrait, resulting in something a little different. I am not usually one to use photoshop plugins all that much and usually just use a couple from NIK software just to add something different to a couple of images. Anyway the last couple of days I have allowed myself to play around with a couple of new plugins (well new to me anyway). Both are from Alien Skin and I think they would both find a place in my workflow. First up is Exposure 3. I have previously written a post comparing two plugins that can replicate film looks Silver FX pro and DXO filmpack. Well exposure 3 does pretty much the same thing. It has a whole selection of films that can be replicated. Most popular black and white and color films are catered for. There are 35mm, medium format and large format examples all with lots of potential customisation. The first thing I noticed with the colour film presets is that they are much more pleasing on the eye than the dxo filmpack results. The colors are rendered more naturally with real tonal depth, which DXO filmpack doesn't always have. The second plugin is Bokeh 2, now this is definitely not something I would have ordinarily used, but I thought I would give it a go as I was interested to see how would work. I have to admit I am impressed. The plugin basically creates realistic bokeh effects. In theory allowing you to shoot a scene at say f16 or f22 and then choose a point of focus later on. Early usage suggests that it needs to be used sparingly to maintain truly realistic results. There are so many customisable options that it is a tiny bit daunting at first. You can change between different aperture effects, both twist and zoom motion effects and a few more presets. I just did a quick trial of some the features and decided to use a distinctly average image taken in Istanbul. I started by adding a Kodachrome 64 slide filter to the image, which nicely boosted the saturation and a bit of the detail and then added a zoom filter to make the shot a bit more dynamic. I then cropped it slightly to aid composition. I also had a play around with the black and white setting, especially my favored tri-x look and I think the results are very good. The level of control is really good and is probably more in depth than silverfx pro (certainly easier to use). The UI is a bit dated but I can live with that. Its a little worrying being able to change the whole dynamic of the image with just a couple of plugins and about 5min in photoshop, but that is how it is today. You can't make a bad shot good, but you can make it different. For most of my photojournalism work I prefer to produce Black and White images. I cannot pin point why exactly, but it could be based on traditions or fact that it seems to concentrate the viewers attention on the content of the image making it more graphic. I find that sometimes color can over power the message of the image, unless handled correctly. When I used to use my trusty Pentax 35mm slr I started off using ilfords HP5 before moving on to Tri-X 400 from Kodak. I really liked the way Tri-x could handle being rated at ISOs producing usable results whilst being pushed as high as iso 1600. Since moving to digital I have experimented a lot with different methods of getting Black and White images, I've used photoshop actions and Lightroom presets (I have to say that LR 3 presets do a good job) but have struggled to find a method that is fast, but produces great results with easy customization. Enter two pieces of software, DXO filmpack and Nik Silver FX pro. In a previous blog post I raved about the merits of Nik Software collection so I have to admit to already using Silver FX pro, where as DXO filmpack is reletivly new to me. This is not my first experience with DXO filmpack as I have previously used version 1 a few years back, but this is the first time I have really delved into the functions and studied the results in any way. DXO filmpack can act as a stand alone program or as photoshop plugin, although there is no support for CS5 64bit (should be supported in version 3). I used the stand alone program for this test. The user interface is very much old school windows and reminds me of programs running on XP. It is easy to navigate though. Using the drop down menu "color Rendition Profiles" you can choose first of all wether to use "color negative", "color Positive", "B&W film" or "cross processed". Then there is a choice of film profiles to choose from. All the major films are covered from the likes of Agfa, Fuji, Kodak and Ilford. This then gives you a set contrast, saturation and brightness to mimic the film. One thing I do like with DXO filmpack is that the grain is handled separately, you can get the look without necessarily having the grain, it also enables you to mix things up a bit with using separate film profiles with grain profiles, without having to use individual sliders. Another good feature is being able to change between grain from 35mm film, Medium format and Large Format, this is a nice touch and can really change the look of the image. Similar to DXO filmpack, Silver FX Pro (SFX) can be used as a stand alone software or as a plugin for Photoshop. To start with the first good thing with SFX is that it works with 64 bit photoshop, this saves a bit of time as I often work with my images in photoshop after processing the RAW files in LR. 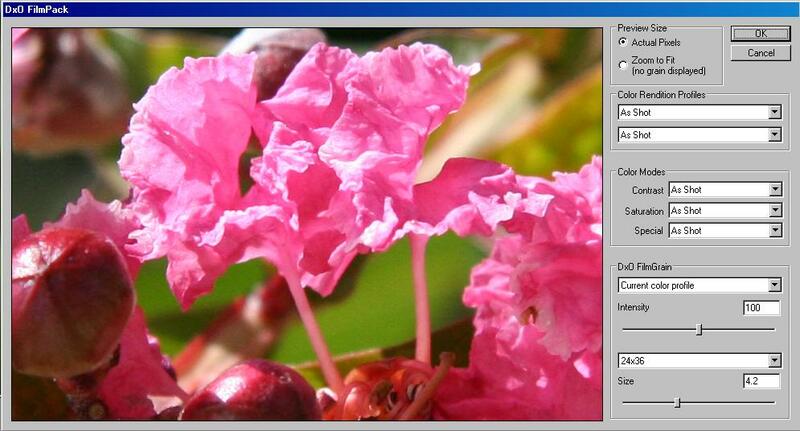 However it can also be accessed from Lightroom as can DXO FP. On launching you are faced with a much more modern UI. On first glance it seems a bit more complicated with plenty of options. It should be remembered that SFX is not just a film reproduction software and can only handle B&W conversions. In this regard it offers much more in terms of B&W processing. On the left hand side you have a filmstrip showing all presets available and the effect they will have on the image. For this test though the important issue is film mimicking. In this regard SFX is not quite so intuitive with the options hidden on the right hand side in the drop down menu "film types". When I first used SFX pro I assumed from the layout that you process your B&W image then choose the film type to replicate the grain, however this is not how it works as any film chosen within the menu will over ride any previously chosen options. This makes me wonder why the film types is not under the preset options on the left as this would make a bit more sense. Ones into this option though you again have a similar selection of film presets (only B&W in this case). As mentioned before with DXO FP, you can use Grain Presets to quickly change between Grain profiles, whilst with SFX you only have a selection of slider which can easily go wrong if you are not careful, although similar results can be achieved by playing around with the settings. For a fair(ish) test I have taken a recent image of mine and converted it to B&W using the Tri-X filter. This not a scientific test of the software but just a visual comparison of how both pieces of software interporate the process. Out of the two images I think the SFX one is probably more true to the original Tri-x results and has slightly more contrast resulting in a slightly punchier image, however there is not much difference between the two and the film grain presets in DXO FP are good to use and a quick way mix things up a bit and I do like having the option of color film presets too. Color film presets can be done in NIK color fx pro, which would be available if you bought the complete collection, however it is nice to have all film presets in one program. If B&W processing is the main priority then I think SFX has the edge due to the level of customization allowing you to create very individual B&W images. Any recipe created in SFX can be saved as a preset which is good. If you wanted to replicate all different film looks both color and B&W then I think DXO FP is a very viable option (especially if version 3 works with 64bit CS5). All in all both work really well and although I think I will probably stick SFX for the time being I will have a closer look at version 3 of DXO FP as I think it could find a place in my workflow. For a while now I have using the Nik software collection of photoshop and Lightroom plugins. They can be bought separately or as a complete collection. These plugins have shaved hours off of my editing times and although they cannot quite replace the hard work of manipulating every aspect of an image manually, they do help speed up the every day process. I love these plugins and as a collection they cover all aspects of the image editing process. They are designed primarily to turn Photoshop into Nikons Capture NX2 which I think is a wrong way of looking at it. It does however bring capture NX2 style editing to Photoshop to those who wish to use it in that way. I personally don't. I use photoshop for a reason and don't use capture NX2 for other reasons (although the results from capture NX2 are really good). The complete collection from Nik comes with several Programs which are used as either stand alone programs or as photoshop plugins. I'm not going to go into detail with all of it as that is what the ink website is for and can be found at www.niksoftware.com. I will talk about the things I us the most. This comes down to Silver fx pro, Color fx pro, dfine and sharpener. Silver FX Pro is a really cool black and white plugin which produces some of the best results I have seen outside of black and white film. The great thing is that it does also produce images based on film styles, so presets can be chose to replicate the behaviour of say Ilford HP5 or Kodak Tri-X, producing accurate film grain and contrast. It is one of my favourite pieces of software ever (right up there with football manager) and has made it easier for the standardise my black and white images, by creating custom presets. Another one I use quite a bit is Color FX Pro. This has many different filters and effects, most of which I will never use, however there are a few which are massively important to my workflow. The main one is the dynamic skin softening. This works really in selective softening of the subjects skin. You can use a colour selector to choose the tones which are softened and adjust what object are softened. Another excellent filter is cross processing. This gives the effect of the old fashioned "washed out" colours from the 60's and 70's that is currently having a resurgence in fashion advertising. Dfine and sharpener are very good for noise and sharpening although I do not use them as much as the others as I tend to use Lightroom and photoshop for this. I would seriously recommend these plugins for anyone who wants to improve their workflow as they enable you to play around with different things and it takes seconds to create basic but decent results.